I've been reading your blog and thought I'd try and see if you respond to my questions. I'm desperate for answers and I've seen 2 DPMs and 1 Ortho surgeon with foot/ankle specialization. Each of their prognoses is different and so is their proposed treatment. I'm going to get one more opinion from an ortho too but if you have any insights, I'd love to hear them. I'm a 34 yo female construction manager, rock climber, dancer (ballet growing up, lots of Latin dancing in heels as an adult). I hate running so I'm not as concerned about losing my ability to compete in triathlons. 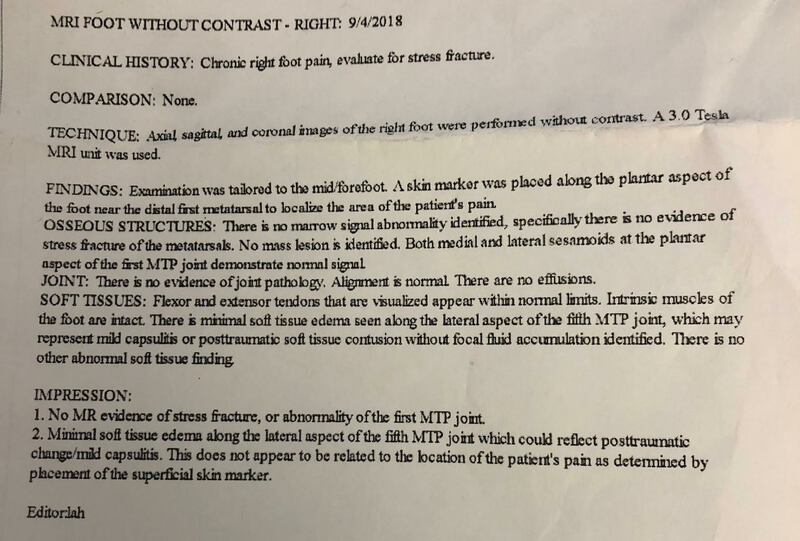 initial injury occurred in rock climbing in late March 2018. There was no impact, but I was standing in a precarious position for over 45 mins standing over a chasm and didn't have much room to move. My weight was mostly evenly distributed between my feet but my toes were hyper-extended and all the weight was on the balls of my feet. I was in instant pain in my left foot that felt like a hit a pressure point. My foot became instantly numb and remained that way for the rest of my 6 hours climb and hike down the mountain. the feeling in my foot came back the next day but my toes stayed numb for 6 weeks. I did not go to the doctor because I had no idea I could have broken a bone by just standing on my foot. It's common for climbers to complain about toes going numb so I just rested for a few weeks and didn't think much of it. (Dr. Blake's comment: The numbness is either from compressing a nerve for too long as you describe or from the intense swelling internally from a fracture or sprain, that pulls pressure on the local nerves. Or, a combination of course). 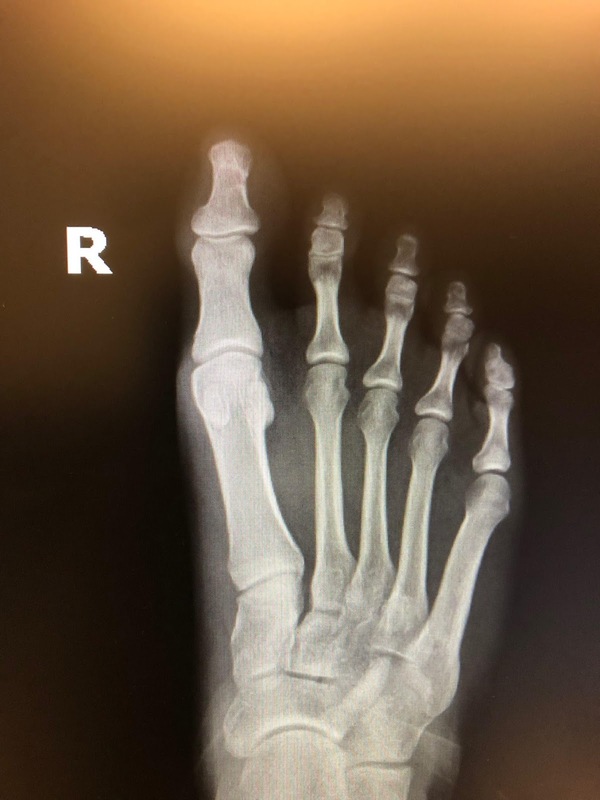 Aug 3, 2018, I was diagnosed with a lateral sesamoid fracture. I wore a boot and unna wrap for 4 weeks while my DPM was taking x-rays every 2 weeks telling me it was healing. By Aug 28, 2018, my pain was increasing not decreasing and the ball of my right foot is now hurting because of me trying to offload the left foot. The DPM Xrays both feet, says the left fracture is still healing and the right foot shows no signs of fracture. The DPM put me in the iWalk crutch and ordered an MRI of both feet since I was still having pain. 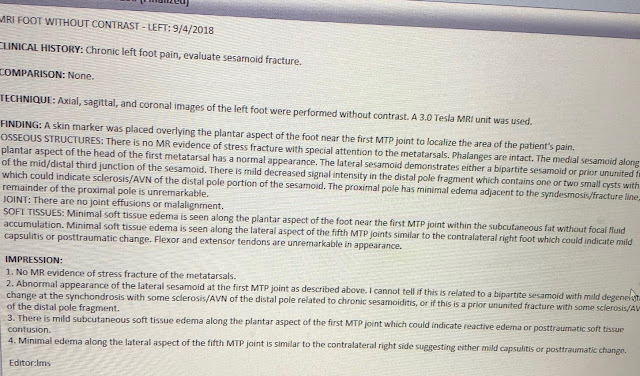 I've had J pads in the boot on the left foot and orthotics also with a J pad on my right foot because I was starting to have pain in that foot now. (Dr. Blake's comment: I am sure this is Dr. Jill's Gel Dancer's Pads or something similar). DPM #2 says it's fixable with 6 months in a boot and exogen bone growth stimulator. Do I really wait 6 months in a boot with an expensive contraption waiting for the bone to heal (what if it IS bipartite?). 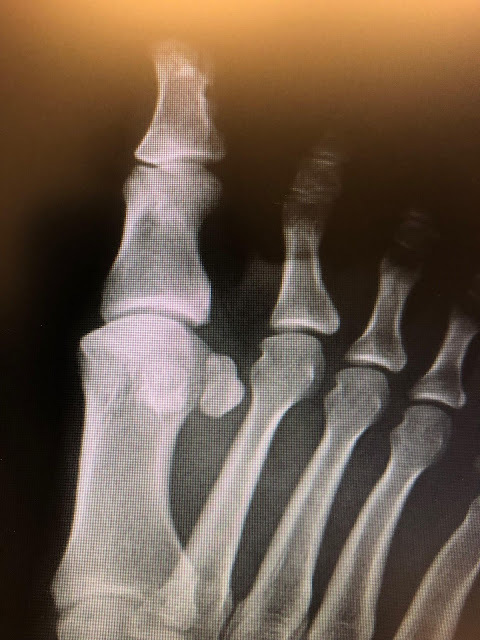 Will the exogen doing anything for bipartite sesamoid? (Dr. Blake's comment: I agree sort with the DPM #2. I will look at the images you sent below to comment on the bipartite aspect). No one has commented on the right foot having a bipartite sesamoid or not. It was not specifically mentioned in the radiologist's interpretation but when I look at the Xray it looks possibly bipartite to me. I've been researching this a lot and I've seen that 90% of bipartite sesamoids are bilateral and occur on both feet. 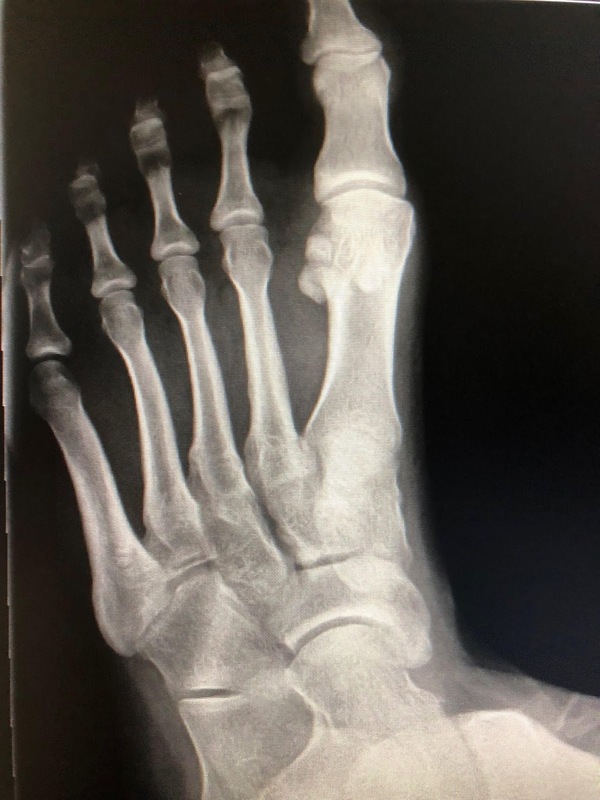 Can you see from my Xrays if both my right and left foot of bipartite lateral sesamoids? I've attached my L and R foot Xray from 8/28/18 and summary of the MRI interpretations, in case you have time to look at these. (Dr. Blake's comment: Please send me a disc of the MRIs to Dr. Rich Blake, 900 Hyde Street, San Francisco, Cal, 94109. Please email me at rlb756@gmail.com when you think I got it. I want to see how inflamed the sesamoids are). 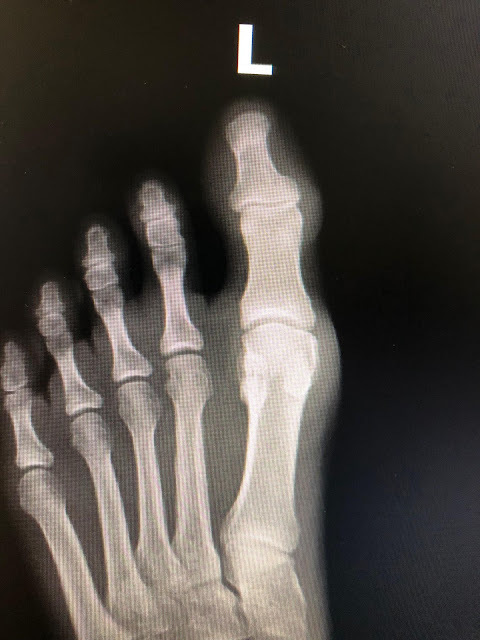 This does look like a lateral or fibular sesamoid stress fracture with irregularities where the junction between pieces area. 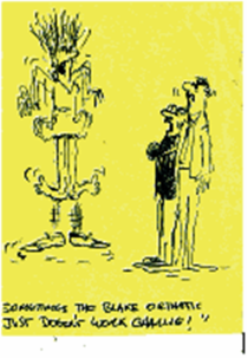 Bipartite usually look more symmetrical and rounded borders. To me, it is the incredibly long first toe and metatarsal that makes this prone to injury. Yes, removal of the one sesamoid could set up problems for the other. Here the lateral sesamoid looks more like it is bipartite, which shows you have the bone overlap from the first x-ray distorted things. If it is bipartite and began to hurt with prolonged hyperextension, I wonder if you have a turf toe situation. Has anyone mentioned that? I read this as mild injury to a bipartite sesamoid junction leading to a mild reaction of the tissues. Maybe once I see the views the mild level will look more like moderate. The biomechanics of Turf Toe, where you hold the toe on the ground, and you stress various things, like the bipartite junction to cause injury or one of the muscles or ligaments (not noted) makes sense here. If you switch to turf toe protocols, it may make more sense then sesamoid fracture protocol. The treatment can be some the same and some different. Create that 0-2 pain level consistently. More obvious bipartite. A CT scan should be ordered for your left. Again, the long first metatarsal and toe (called Egyptian Foot in ballet) which takes more stress than normal. Sesamoids look different on MRIs. They are wrapped up in ligaments and tendons, and unless they are abnormal (as in your left side) they look normal. Your workups have been good. Until I see your films, 3 months in the boot, with an EvenUp on the other shoe to keep the weight normal. If it is Turf Toe, spica taping is key, and probably advancing gradually to bike shoes with embedded cleats.